Mother Nature smiled on us earlier this week - we were able to grill two days in a row (Sunday & Monday)! 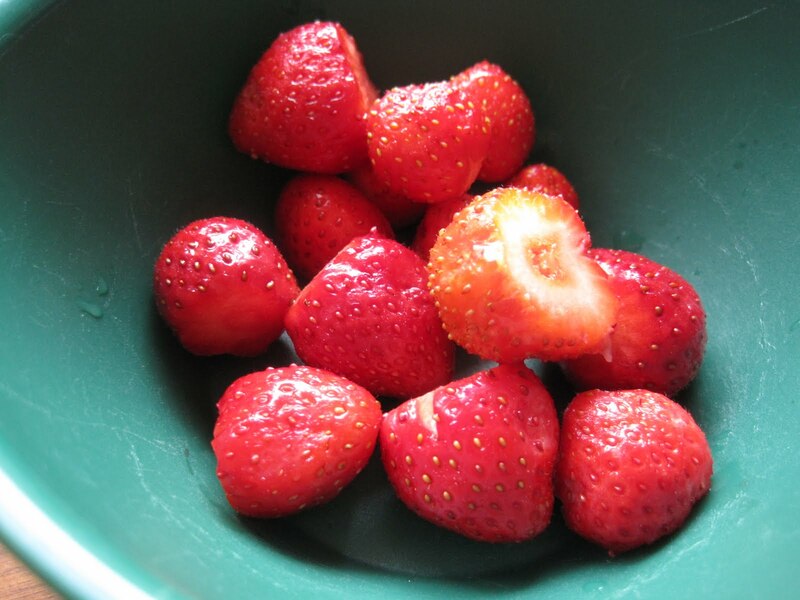 But before I write anything else, I need to sing the praises of the strawberries from Simmons Farm: SP stopped by last Saturday and bought some strawberries. These are so good! Smaller than the ones in the huge containers at Costco that we usually buy, but such amazing, juicy flavor. Yum! I've been having some every morning for breakfast. The marinade is very simple, and can be made to suit your taste. The main marinade is equal parts olive oil, fresh lemon juice, and vinegar (apple cider or white; I used white). I used fresh, not dried, oregano, and didn't try to convert the dried oregano amount in the recipe into an equivalent fresh amount - I just chopped up a bunch of fresh oregano until it looked good to me!!! Season the marinade with salt and pepper. I like pepper, so I probably added more than the recipe calls for and I probably went a little light on the salt. The recipe also calls for grated onion and garlic. I omitted both. The nice thing about kebabs is this: I could have a skewer of beef kebabs and SP could have skewers of whatever he wanted. He bought me two smallish rounds of beef tenderloin; we froze one and cut the other into cubes for kebabs. 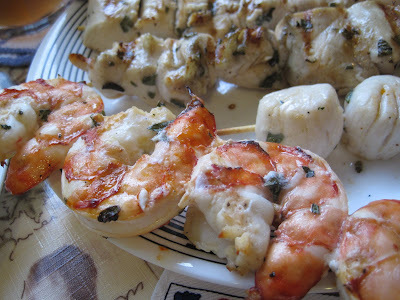 He also got 4 huge shrimp from Costco, 4 scallops, and we thawed and cubed a chicken breast. Each had it's own container in which to marinate. I had everything marinating by 2 pm and we skewered/grilled everything around 6:30, so I'd say marinate your meat/seafood for 4-5 hours. Every time I passed by the refrigerator, I would open it and shake each container to mix up the contents and marinade. These kebabs were so tasty. 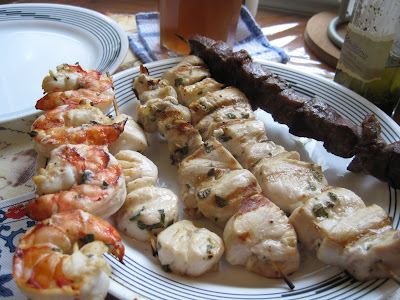 I had just one shrimp and one scallop - I let SP eat the rest since I had a skewer of beef for myself. I ate half my beef skewer, we each ate a couple of chicken cubes, and we ate all the seafood - the rest we saved for a second meal later in the week. 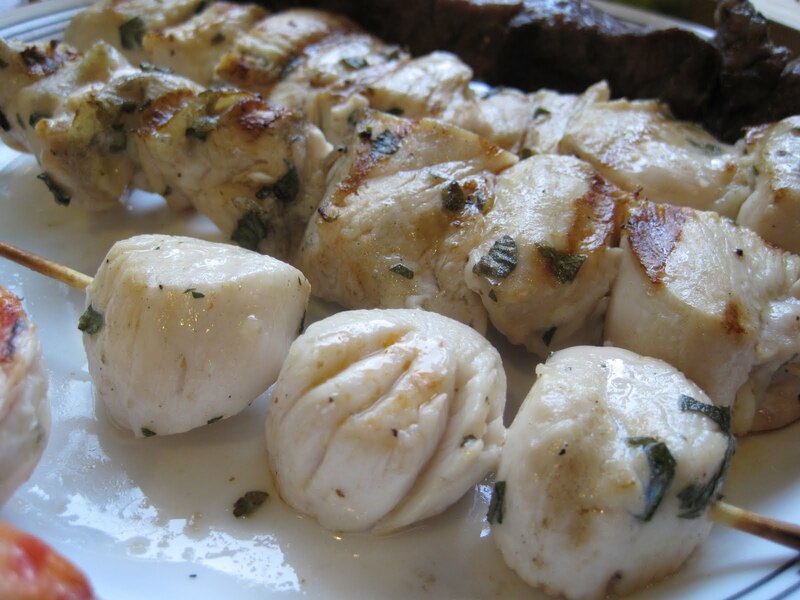 The marinade flavors the meats more than it flavors the seafood, but you could still taste some lemon & oregano on the shrimp & scallops. In addition to the meats/seafoods, we grilled some veggies. We didn't skewer them because sometimes skewers can make the tomatoes and/or mushrooms split apart. Instead, we grilled them on the grill tray. In addition to mushrooms and grape tomatoes, we grilled a green pepper (from Simmons Farm). 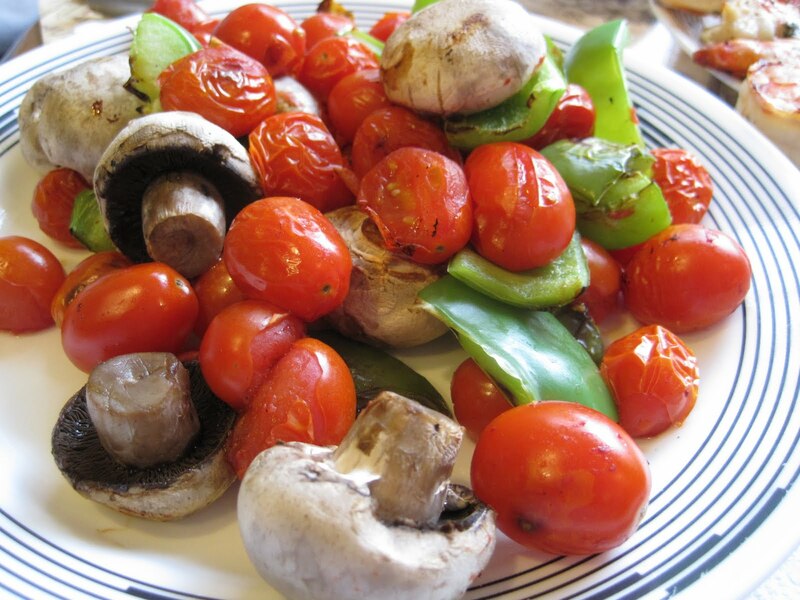 I love grilled veggies, especially tomatoes. We didn't put any marinade or sauce on the veggies. Have I mentioned how much I love grilled veggies? I really miss them in the winter. Hopefully the grill pan will enable us to grill veggies in cold, snowy months, but nothing beats veggies charred outside on the grill - especially those just barely split open tomatoes! Yummmmmm! My favorite summer dinner, too!